Placing the Deathmantle set at number 7 was both surprising and difficult. 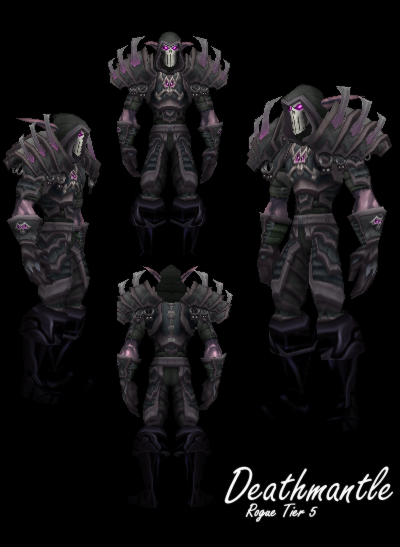 This set is amazing and regarded as not only the best looking rogue set but the best overall set by many. Maybe some will take points off because the shoulders are not very rogue-like, but who can argue against their sheer coolness? Add to this one of – if not the – best looking helm of any class or tier and it is clear that the Deathmantle deserves consideration as the best set ever made. This entry was posted on August 1, 2011 at 12:34 am and is filed under General, HFL, MMO, Podcast, Raiding, Role Playing, World of Warcraft. You can follow any responses to this entry through the RSS 2.0 feed. You can leave a response, or trackback from your own site.